Dogs love snow. So, in the wake of the Polar Vortex and blizzard season, we asked experts the burning question: why do dogs love snow so much? Stanley Coren, a scientist and Professor of Psychology at the University of British Columbia and expert in canine psychology, said that many dogs love snow in the way that a toddler loves snow -- it's simply fun to play with. "Dogs like to manipulate their environment," Coren said. "They will play in pile of leaves, just like the way kids do -- the mind of a dog is very much like that of a two-year-old." Snow, Coren said, provides dogs with a new experience, a new material to interact with -- which is fun and exciting. "They will roll and bounce in it -- it's really the fun of manipulating something," he said. "It is essentially play behavior." But Coren also said that not all dogs will exhibit this behavior. Often, it's common to see dogs with thick fur playing in the snow. Nordic breeds like huskies and retrievers, which were bred to thrive in cold, snowy conditions, tend to like snow much more than those with thin coats like greyhounds and chihuahuas, which will get cold quickly. Dr. Peter Borchelt, a certified applied animal behaviorist, agreed with Coren, again stressing the similarity of the behavior of dogs in snow with children in snow. "Dogs will play with something that is interesting and moves in a different way -- it feels interesting," Dr. Borchelt said. "But some will play a little and then get bored, while others will really like it." He added that while play behavior is often hard to define in a psychological way, it's incredibly common in all social animals. "It's about novelty and creating different movements -- they're trying to learn what is this thing and what to do with it," he said. So, when you see a dog burrowing or rolling in the snow, it's likely they are just having a great time. And to get you through winter, we've compiled the very best videos and images of dogs and their exuberant relationship with snow. 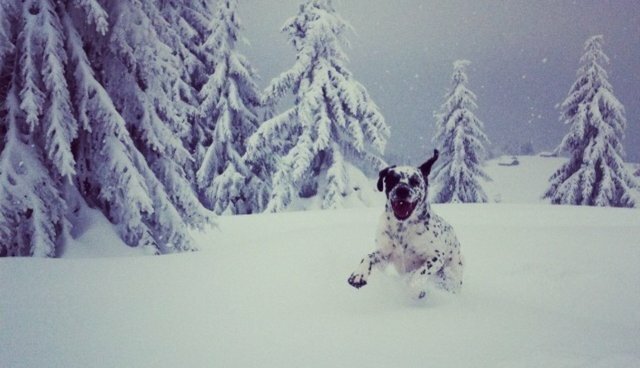 If you have a picture, video or Vine of a dog enjoying the snow, show us! Sign up for an account on The Dodo to submit or just add #SnowDog or #TheDodo to your social media content and we'll post your submissions below.